Has Google knocked your website out of the search engine rankings? Has Google seen to it that your organic search visits have dried up? Did you receive a manual or algorithmic penalty? If your answer is yes then don’t despair. You can repair the damage and get back to where you were before. Just don’t assume that it will be easy or quick. I have worked on several penalty recoveries and can tell you that the work is not easy. It takes a lot of time and patience but can be done without having to revert to paying someone else to do it all. It just takes detailed research and lot of time sending emails and responding to them. This will be a 3 part article on the process of recovering from a Google penalty so be sure to check back for the next two parts. and all of this is just to submit a reconsideration request. If Google accepts your request and removes the manual penalty you will not find your site back in the search results where it used to be. It takes months of work to reestablish the credibility of your site with Google, and you can’t use the old tactics that worked in years past. If you don’t do enough to clean up the mess Google will simply deny your request and advise you that they still detect actions in violation of their Webmaster Guidelines so make sure you do a good job! So how do I go through this process? The first step is to determine whether your penalty was algorithmic or manual. Algorithmic Penalty: Algorithmic penalties occur when the Google algorithm notes something that is not in accordance with Google Webmaster Guidelines and results in the automatic removal of whatever credit you were receiving that helped boost your search engine ranking. 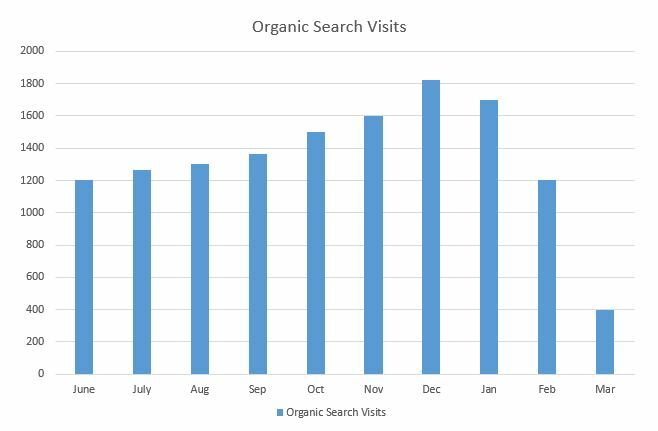 This will be shown immediately by a drop in search engine ranking and a loss of traffic. You can easily check Google Analytics to determine exactly when the drop in traffic occurred and verify which algorithm update (visit http://moz.com/google-algorithm-change content=”nofollow” ) it was associated with to identify the exact problem Google noted. I have found that the majority of recent manual penalties are associated with links (both inbound and outbound) and this is the area I will be addressing. To begin with, it indicates that you or your predecessor did things that may have worked in the past, but are now harmful. It may have just been following the pack with the things that worked quickly such as buying links, link posting on forums that permitted Follow links, heavy anchor text linking wherever you could get them, using blogrolls and myriad other tactics that sent websites onto Page 1 quickly. Another area that could have caused a problem is posting links in your blog or allowing unmoderated comments to blog posts. It is time to admit that those tactics no longer work and you need to clean up the links. There are a number of tools to help you in identifying where they are and this is the biggest problem you will face. Google will be quick to penalize your site but won’t help you much in finding out where all those problems lie. There are a number of tools at your disposal, some free and some paid to help identify where the problems lie. Webmaster Tools is the first place to look for sites that link to you. The problem is that it will only give you a small percentage of the sites linking to you and they may not be the cause of the problem. On the plus side is that they will tell you the sites that link to you the most and this may be your problem. Site wide linking is one area that will grab Google’s attention quickly. Gather your list from Webmaster Tools and move on to other tools. I like Link Research Tools to give me a much greater listing of sites linking to me however this is a paid tool. One of the feature Link Research Tools provides is the anchor text of all links so you can quickly check on whether your anchor text linking is high for certain keywords, another possible problem area. I also look at the referring sites list in Google Analytics. The fact that you receive referral traffic from a site does not mean that Google has not identified it as a bad neighborhood or is a site that has received a penalty itself and is no longer indexed. I also like to use SEO Profiler which provides you with the date the link was created so you can check to see if your link velocity may have attracted attention, a clear sign of unnatural link building. Finally I use the Wintzell Outbound Link Checker and the Web URL Opener: Out Bound Link Viewer tools to identify all outbound links from the website. Check back for Part II where we will cover the details of that tedious work and Part III where we will discuss how to put together your Reconsideration Request to recover from a Google Penalty.